(CNN) - Marcus Bachmann, the husband of Republican presidential candidate Rep. Michele Bachmann, defended his Christian counseling business over accusations it uses a controversial therapy that encourages homosexual patients to change their sexual orientation. In an interview with the Minnesota Star Tribune published Friday, Bachmann did not deny that he or other counselors at his clinic used the technique, but said they only did so at the request of a patient. "Will I address it? Certainly we'll talk about," Bachmann said. "Is it a remedy form that I typically would use? … It is at the client's discretion." The American Psychological Association has said there is "insufficient evidence to support the use of psychological interventions to change sexual orientation." Bachmann said the business, located just outside Minneapolis, mostly treats those suffering from depression and anxiety, who already accept religious faith as part of their healing process. 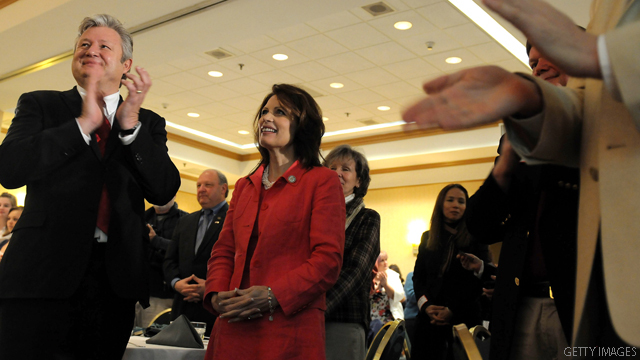 "We don't have an agenda or a philosophy of trying to change someone," Bachmann said. When asked about the undercover video released to CNN by "Truth Wins Out," a gay rights group, that showed a potential patient being told he could become heterosexual, Bachmann said someone must have doctored the recording. "This individual came to us under a false pretense," Bachmann said. "The truth of the matter is he specifically asked for help." - CNN Political Correspondent Jim Acosta contributed to this report. Could you imagine if Mr. Michele Bachmann is discovered to be gay, or even 'converted' from formerly being gay? Praying away the Gay will be hung around Rep Bachmann's neck for the remainder of the election cycle like the collars and nooses blacks were subjected to back when she claims their children were better off. How in the world did the GOP let the nuts in their Party take center stage? marcus bachmann is not a real doctor (online unaccredited degree), but he is absolutely a homosexual who hates himself. When a member of the medical profession is asked for help, whether or not its under "false pretenses" is irrelevant. They are obligated to offer help. He offered a form of therapy that is not endorsed by the APA or the AMA, and if it was a form of treatment he was not comfortable recommending, he was under no obligation to give it and should have not have described it. The truth is that he was comfortable giving that therapy, and he offered it without much quibbling. His defense is so pathetic and weak as to be laughable, but what he was doing was not laughable, its quackery. Couple that with the possble Medicare fraud angle, and Mr. Bachmann will possibly be needing legal help. BTW, I find it amazing the cons getting either upset of dismissive of this when they fully endorsed James O'Keefe's heavily edited sting of ACORN and Andrew Breitbart's video drive-by (heavily edited again)of Shirley Sherrod. This revealed, without editing, that Marcus Bachmann is, at the very least, a quack, and a danger to his patients. I'm sure that interview will satisfy everyone. Besides, if his business "mostly treats those suffering from depression and anxiety, who already accept religious faith as part of their healing process", why do they need him?? "Bachmann said someone must have doctored the recording." So, now we know that not only has the Bachmann clinic collected almost a million over 6 years in Medicaid, but they are using the funds to "cure" homosexuality through "christian" prayer treatments? Seems to me this "clinic" owes the tax payers about a million dollars and some time in court explaining why this is not committing fraud to obtain federal funds. Should some one from the state child services department check on the 23 foster kids that Marcus and Michele Goebbels may have "experimented" on when under their care? I love how this tape must be doctored but any tape made by a right wing group is oh so true!!!! I've been in the counseling field for almost 30 years and I have yet to meet a counselor (religious based or not) that would start with a new client that was seeking counseling about their sexuality that would say something about how God made mans eyes to look at women's breasts....that is just inappropriate. "Is it a remedy form that I typically would use? … It is at the client's discretion." RIGHT, my internist always give me a multiple choice form to select my care. Do, these people really think we are all as stupid as the simpleton tea baggers??? Oh yeah, if God made a mans eyes to look at a woman's breasts, does that mean he made a women's eyes to look at a man's package? That would go along with the counselors logic...wouldn't it??? I heard the interview, all the activist said was that he was gay, your counselor suggested the "cure". When all else fails, say the video tape was doctored. so THIS is what some want to be the "first Man" of the White House??? What the hell has happened to our country. In the words of others before me but in an entirely different text.........I WANT MY COUNTRY BACK!!!! Yes, yes. It is the people who made the choice to come to the clinic. If any of this "reparative therapy" stuff worked, this is okay. It's just disgusting when you look at it in a way that people are making decisions that are going to hurt them. If these therapies are linked to depression and suicide, how is it helping to encourage people go through this? I consider this somewhat like using drugs to solve your problems. It does nothing more than harm yourself, but even more worse, it's completely misguided. Are you gonna give somebody some drugs and claim it will solve anything? Is it the homosexuals who are barbarians, or is it the society for being barbarians for putting this sort of stress onto people for being different? If you ask me, I find that the blinded haters are the real barbarians. Don't do any more damage than what they don't deserve. Poor chap couldn't offend his god by marrying a man so he did the 2nd best thing... married Michelle Bachman. He went on to help funnel our tax dollars into his fraudulent religious endeavor. All seems pretty clear to me. Big deal. In college, I saw lots of people who were converted from straight to gay with similar counseling. Oh, and a few beers. Did the Bachmann clinic bill Medicare, Medicaid or private insurers for this therapy? Insurers do not pay for experimental treatment. They pay for treatment which is accepted by the medical community as standard care, and reparative therapy is not accepted as such by any major medical, psychiatric, psychological or counseling organization. If Bachmann billed insurers for this without clearly identifying the treatment provided, it is insurance fraud. If public or private insurance did pay for this, they should demand the return of these funds.